We’ve been wanting to get a bag of “littlenecks”, the smallest and tenderest of clams, for quite some time now, but Jon would always forget to mention it to Scott for some reason or another. Finally last week, he remembered to remember, and a big bag of these guys were waiting for him in the office refrigerator on Monday morning. I knew I wanted to do a pasta with clam sauce, but all the other ones I had tried in the past were kind of lackluster. So, I turned to Giada. I’d found both of her cookbooks in the thrift shop for $1/piece (one man’s trash is another man’s comeup!) and there was a recipe that looked great, yet had a simple ingredient list – precisely what this dish should be. And, I’m pleased to report that this recipe fully lived up to my expectations. 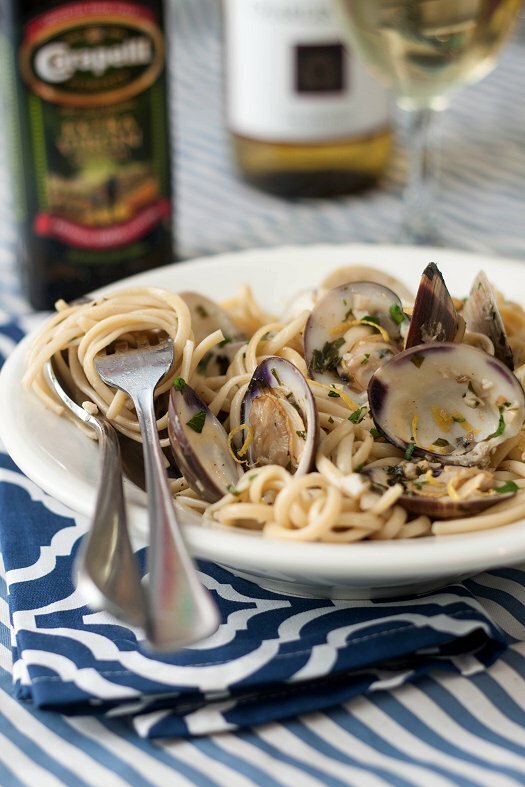 A punch of garlic, a little bite from the addition of white wine, and then just an awesome brininess from the clams that rounds out all the flavors and brings everything together. So quick, too. Dinner is literally done in the time that it takes to boil the pasta! Winner, winner – clam and pasta dinner. Have a great weekend, kids! Meanwhile, heat the olive oil in a large saute pan. When almost smoking, add shallots and garlic and saute until soft and translucent, about 3 to 4 minutes, being careful not to burn the garlic. Add the clams and wine. Cover and simmer for 6 to 8 minutes or until most clams have opened. Add 2 tablespoons chopped parsley. Whisk in butter to thicken sauce slightly. Drain pasta in a colander. Do not rinse pasta with water. Place pasta into the clam saute pan and mix thoroughly. Season with to taste with salt and pepper. Pour pasta into large serving bowl. Zest lemon over the dish. Garnish with remaining parsley. Serve immediately. Beautiful! And you are so lucky to have such fresh clams around!